Sophie (red tri) was our first Aussie she is 21/2 years old. We loved the breed so much that we wanted to add to the family. We told our breeder that we wanted a blue merle so when the litter was born she called us and told us she had our puppy. Harlee is 1 year old. We can not begin to express the love for this breed. Sophie is very loyal to me and Harlee is the same to my husband. I will never own another breed except an Aussie. We will be adding an addition this summer to our family. What a great dog they are. 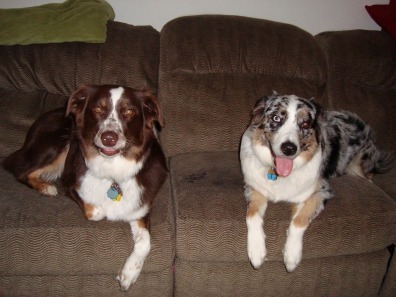 I have an aussie that looks like your Harlee......they are the sweetest dogs! I also have a lab. The aussie is difinately the alpha dog. Been thinking about getting a 3rd aussie. It is just hard to believe that they would act like a bunch of teenage girls! Thanks for sharing. I agree with anonymous.. be very careful when adding a 3rd dog to your family. I know from experience that the statement she/he made is correct. That is true of ANY breed! My household went the same way.. two would play,then the 3rd would try to play and was usually ignored,even though they were all the best of pals. In another case, they would gang up on the submissive one and bully her around. Dont get me wrong.. the more aussies the better just be very careful with your selection to make sure you get one that will be the most benificial to your pack.